Just two weeks after announcing its acquisition by Citrix, online collaboration service Podio is back with a new exclusive announcement – Evernote integration into the platform. Podio offers teams access to online collaboration, by allowing them to share files, manage tasks, and create custom apps designed specifically to suit its users’ unique needs. By throwing Evernote into the mix, Podio is giving its users direct and seamless access to notes, audio and image files already saved in their Evernote accounts. Evernote content can be plugged right into Podio’s workflow, and content can be shared via the desktop or on the go using Podio’s iPhone app, whether in status updates, tasks, comments, or just about anywhere they want to. So how does it work? When sharing a file on Podio, users will see an additional option to connect their Evernote accounts, after which they can browse all of their files from the comfort of the Podio platform. Evernote is a hefty business tool in its own right, keeping its users organized, and while it has its own collaboration features to speak of, combining it with a far more extensive platform like Podio opens up a much wider range of interaction for its power users. 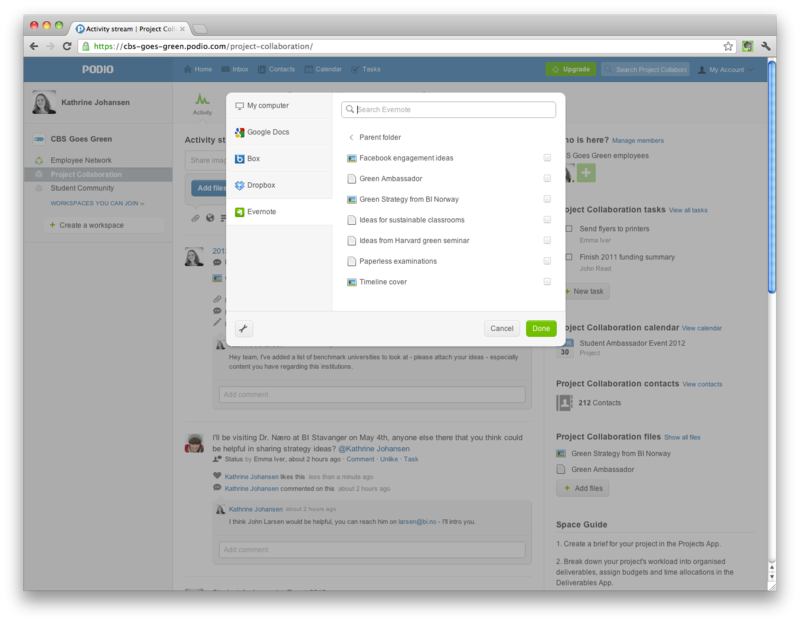 Evernote is far from the first service that Podio has integrated into its collaboration tool. Business users can take advantage of direct access to their Box, Dropbox, Google Apps, Google Docs and Instapaper accounts, among others, making it an incredibly easy way to keep track of and share content in one centralized location. Other Podio features include a recruitment tool, which can be used to accept applications, or other forms of submissions such as surveys and sign-up forms, event management, and CRM software. Founded in 2009 by Danish entrepreneurs Jon Froda and Anders Pollas, Podio received $4 million in funding last year, followed by the opening of a pop-up store in San-Francisco. Following the acquisition by Citrix, details of which were undisclosed, Podio will become part of the company’s GoTo cloud services portfolio.